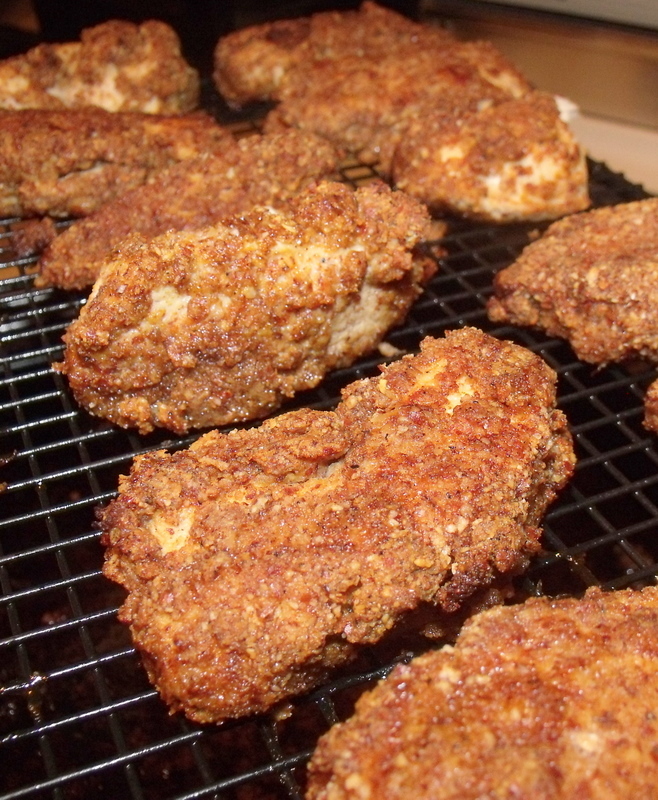 If Paleo or Whole30 has you missing crispy fried chicken, this is the best oven fried chicken recipe I have found. It is gluten and dairy-free and amazing! 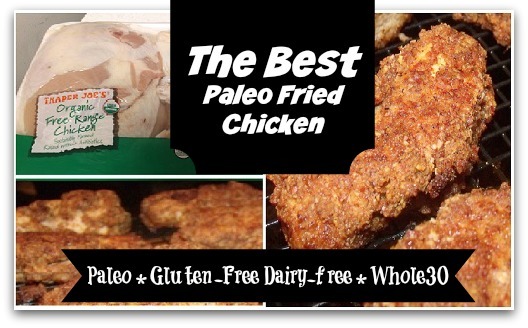 I have been wanting to try this recipe ever since I started eating Paleo-style. I don’t know why it took me so long to get around to it, but MAN, have I been missing out! Paleo Comfort Foods is one of my top two favorite Paleo cookbooks. And when I think of comfort foods, I think about fried chicken. My grandma used to make the most amazing fried chicken, and I was sure that this recipe could not possibly stand up to hers. Well, guess what? It totally stands up. The recipe is VERY easy… and the result is fantastic! My husband raved about it at dinner last night, and we ate the leftovers for breakfast this morning… we just could not wait for lunch. My favorite part is the little hint of chipotle spice. It is PERFECT! I cannot wait to make this again… Doesn’t it look great! I promise that it tastes even better! Heat oil in a large frying pan to 350 degrees. Dip chicken in whisked eggs, and then coat/cover chicken with dry mixture, and place in hot oil. Allow both sides to brown. Place drying rack on a sheet pan and assemple chicken on the rack so there is space between all pieces. Place in 400-degree oven for 10-15 minutes. Isn’t this the Best Oven Fried Chicken Recipe EVER? I’ll be making this… can’t wait. Thanks! I finally got to make this Friday night. Fabulous. Amazing. Was great for breakfast too!! Thanks for the awesome recipe! Just made this for dinner! Awesome! We just tried to make this, we did everything as instructed, but our coating did not stay on the chicken ;(. It fell off during the frying process. Any idea what we did wrong? We’re bummed because it sure smells good!!! You have to be sure to dry the chicken thoroughly before dipping in oil/mixture. I just made it, and it was so good. I have been missing fried chicken. I followed this exactly and then added a few different spices. My coating was perfect. The trick is to pound the chicken first to make it thin. This is a staple at my house. I add to dry mixture: garlic and onion powder and lots of parsley. To keep the coating on, you could double dip if you have to. Be sure to pound the chix first–that really makes a difference. Don’t forget the gravy with almond milk of course.